Unbelievable island views with 2 Kings and 1 Queen bedrooms (or two singles) all beautiful en-suites, air-conditioned. Fans and romantic mosquito nets. The cottage radiates charm and hints of days gone by, but cleverly hides the modern luxuries that ensure a hassle free holiday. Breathtaking views over Dunk and Bedarra Islands will surely soothe any city stress. Exquisitly finished, the cottage has 3 inside bathrooms and 1 outside (complete with garden), all expected amenities such as TV's, DVD, Cd, dishwasher, microwave etc. but also that little bit extra such as the coffee maker. All top quality linen is naturally included and serviced weekly. The 13 metre lap pool gives you the option of an energetic holiday or simply a lovely long pool in which to float around. Limousine transfers from Cairns International Airport can be arranged. 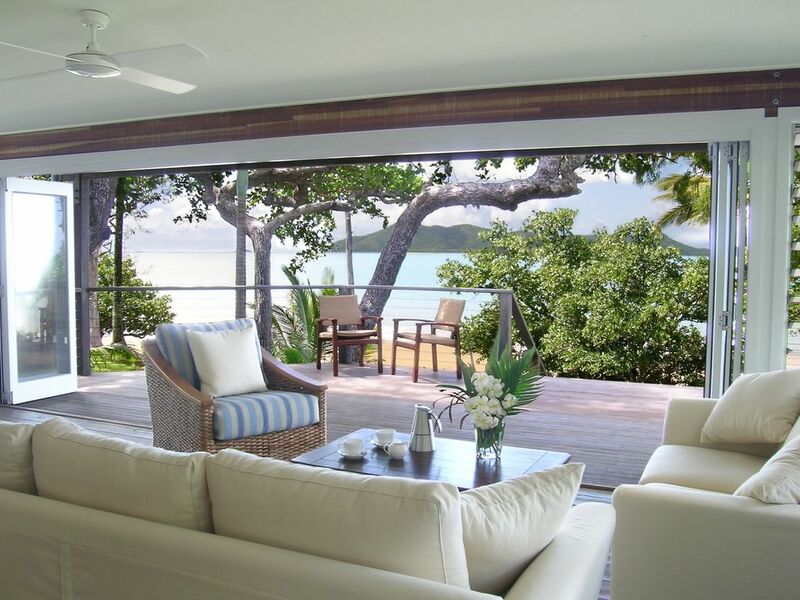 The bi-fold doors open up to cool sea breezes in a perfect setting of swaying palm trees and unsurpassed ocean views! And as the day sitting in a private beach cottage with breathtaking views across to Dunk and Bedarra Islands, sipping Chardonay with your favourite CD serenading you, and the sun slowly sinking. This magnificent luxury beachfront cottage is set on the hill of exclusive South Mission Beach with 20 private steps down to the beach. What's there to do ....? Mission Beach is set amidst tropical rainforest that gives way to12kms of spectacular and unspoilt white sandy beaches. Experience sporting adventure with White Water rafting, sky diving, para-sailing, Jet-skiing, ocean kayaking, scuba dive or snorkel the sites of the Great Barrier Reef. If you prefer to take it easy, sail around the worlds most beautiful islands, laze by the beach, enjoy the variety of eco-nature walks or stroll through the village centre for a choice of cafes and restaurants. toilet, shower, This bathroom is located in the carport area. Only meters to South Mission Beach. Amazing view to Dunk and Bedarra Island. Ask the Girls at Mission Beach Holidays to arrange canoe or stand up paddle board hire for your stay. They will be delivered to the property. Ask the Girls at Mission Beach Holidays to arrange boat hire for your stay. Great to spot to laze on the sunlounges taking in the view to Dunk Island. There is a 9 hole golf course at El Arish (approx. 10 minute drive from 40 on Bingil) and another 9 hole golf course at Tully (approx. 20 minute drive from 40 on Bilngil). We thoroughly enjoyed our family stay at Seasons. A trip down memory lane for us as it was formerly my husbands, parents beach house built in the 1940's but now a total transformation, obviously it had great bones. It was equipped with everything we needed. We loved the extra's supplied. Stunning walks on the beach and the Edmund Kennedy walking track. Fishing off the rocks. We had a great time. Great house, great location, great massages! The house is stunning and the service provided by management and the masseuse (Kylie) was exceptional. The massage was a birthday present for my wife and she did an amazing job. Just book her! We were traveling with a 3 month old baby as well and she was perfectly happy with the temperature in the house and equipment from Mission Beach Baby Hire (Catherine). Mission beach charters were fantastic if you're looking to get out to Dunk or a private beach. Once again just the most lovely and informative people. Views were stunning and the house does an exceptional job of keeping the bugs out. The only advice I could think of would be an A/C in the living area (I think it would save the owner money instead of running a couple in the non-living areas to keep the temperature down) and a blind covering the rear facing windows for privacy in the living area would be great. Those two things wouldn't stop me staying again, I'm just trying to think of some constructive feedback! Great house, fabulous location, excellent views. The house is well setup, very suitable for a family. Lap swimming pool. Suited us perfectly, with 2 kids, grandma and us. Kitchen had everything. Would have liked Foxtel but we played games instead, so maybe that was better. Seasons is the perfect place to relax and unwind. The little touches made our stay - the manager knew we were arriving after shops shut so offered to do a shop for the next morning essentials. Amazing views to Dunk Island! Best holiday house yet! Romantic and private. We loved it. The lap pool was just what we needed! The boys played golf, we lazed by the pool. Loved the view -just spectacular. We were 2 couples and the first time away together.We woke up to the gentle lapping of the waves everyday and wanted to make time stand still.The owners have done a fantastic job with this house. Beautifully decorated without the often gaudy colours! We will be back very soon.